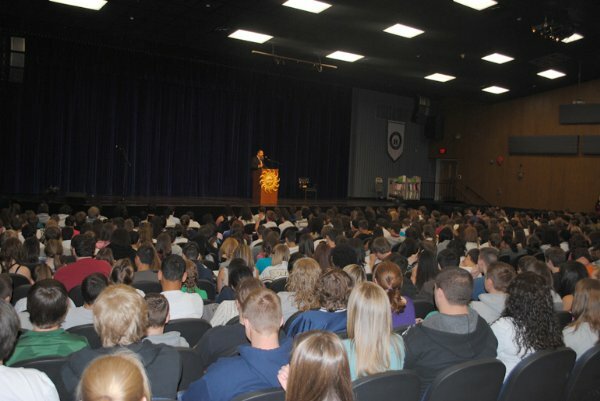 As part of a "Cultural Awareness and Diversity Program", the Howell Township High School invited Rabbi Yosef Z. Carlebach, director of Chabad of Central and South New Jersey, and founder of Chabad House at Rutgers, to address the entire freshman class. More than 600 students were present in the High School Auditorium as Rabbi Carlebach explained the history, culture, and philosophy of the Jewish people. The rabbi's topic included the historical ancestry of the nation of Israel, the Seven Noachide Laws, the Divine Revelations at Mount Sinai, the Biblical and Talmudic eras, and the modern history of the Jewish people this past century. The talk was followed by a lively question and answer period, where the teenagers participated in a unique "Ask the Rabbi Anything:" dialogue. More than 50 teachers and staff members were present from the High School, and the administration has decided to institute this special and innovative program on an annual basis.